Why you should go: Celebrate conscious living through yoga, art, food, and music! Rock n Flow to a class by Teachers Shinead King and Alberto Tafoya to the beats of DJ Katsy Lee. Become AcroMonkeys with Acroyoga Manila for an acrobatic jam session to the live percussions of LikeAnimals and yoga-inspired live art by Jappy Agoncillo and Kara Pangilinan. 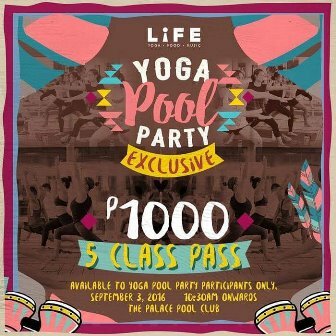 And of course the Yoga Pool Party will not conclude without a splash! Everyone is invited to jump in and cool off at the pool after a long and fun filled day! Other details: Event starts 10 a.m. Tickets at P950.